Those are the numbers that represent the success of the Big Serve this year, and we have so much to be thankful for. 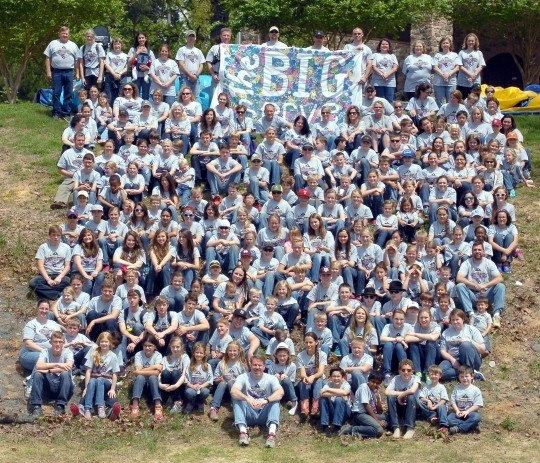 The Big Serve brings together service to our community and fundraising for our school. 20. Our students, parents, and teachers served at 20 project sites last Friday around Nacogdoches. We served churches and ministries and organizations that make our community a better place to live and improve the lives of countless people. Students spread mulch and dirt, picked up sticks, painted, power washed, sewed, dusted, weeded, cleaned, chainsawed, organized, and sang. And then we met together at the school for a big celebration in the sunshine. And 70. The Big Serve has now raised more than $70,000 for our school (a new record for Big Serve fundraising), which is crucial to improve our campus and fund future growth. Awesome job, Regents parents! Parents and students have reached out to hundreds of friends, family members, and neighbors at home and around our nation to bring in these much-needed funds. This is, of course, evidence of not only of God’s faithfulness and favor but also of our parents’ generosity and commitment to this ministry. The reality is that every day at Regents Academy is a big day of serving others, and our school is the constant recipient of our parents’ generosity. But the Big Serve is a special day when we learn afresh that it is better to give than to receive and that if we will love as Christ loves, we will serve as He served. A huge thank you to our friends at Encompass Home Health for their $1,000 donation to the Big Serve. Encompass has been a faithful supporter of Regents Academy for many years now, and we thank God for them! 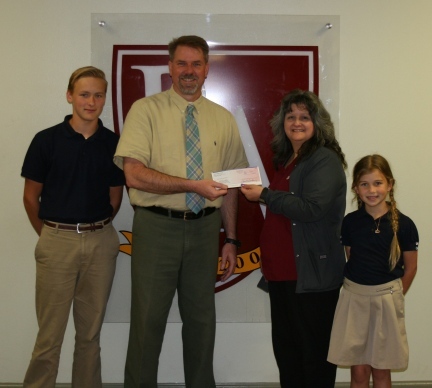 Pictured below is Encompass representative Kim Russell, along with Regents students James Vermillion and Emma Rasberry, saying thank you for the Encompass donation. A huge thank you to Nicole Alders and Randy Booth for helping put the video together. Congratulations to 5th grader Reagan Taylor, whose design idea won this year’s BIG Serve-t-shirt contest. 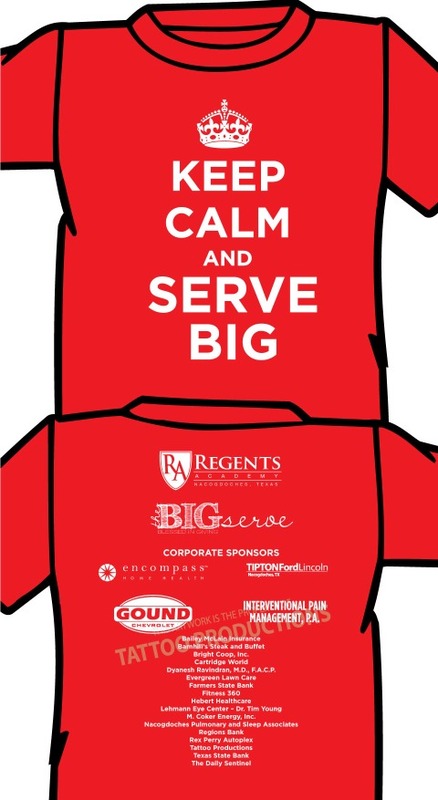 We will be sporting these t-shirts on the day of the BIG Serve, Friday, April 4. Each month you write a tuition check. For many of us it is a great sacrifice. All of us feel it in our budgets. But here is something I want you to know about your tuition check: it doesn’t cover the real cost of your children’s education. Where does the difference come from? First, our hardworking and underpaid teachers bear the brunt of this difference. Regents teachers teach at Regents because they are called to be here – certainly not because they earn a fat paycheck. These teachers, who are willing to work for less, make the education of your children not only possible but immensely effective. But the key way that the Regents budget is funded each year, beyond what tuition provides, is through donations and fundraising. And our most effective fundraiser, by far, is the BIG Serve. The BIG Serve is a schoolwide service project in which our students, teachers, and parents serve their neighbors on one great day of service. This year’s BIG Serve is set for Friday, April 4. 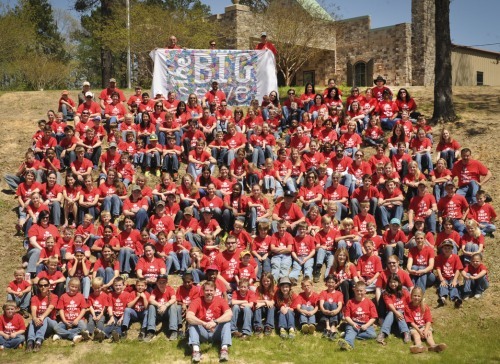 The BIG Serve is also a fundraiser in which our students send out support letters to family members, friends, and businesses around East Texas and around the country. In the four years that Regents has sponsored the BIG Serve, our school has raised nearly $120,000 and invited literally hundreds of friends and family members to become a part of our mission by making a financial donation that helps further realize our school’s vision. We need YOU to be a part and make the 5th annual BIG Serve a success. It is critical to the growth of our school, and it is necessary if we will better support our teachers. You can learn more about the BIG Serve, find out how you can take part, learn about serving our community, and discover how to send support letters when you come to the BIG Serve Kickoff Dinner on Monday, February 24, at 6:00 p.m. This is really one of the best nights of the year as we enjoy fellowship and a delicious meal, and prepare to make the BIG Serve a big success. So please come out. Please support your school by taking part in all phases of the BIG Serve. And thank you for being a part of the Regents family.